When was the last time you saw a really skilled, Funny ventriloquist? Norma McKnight is a knockout as she chats with a hot-blooded granny! 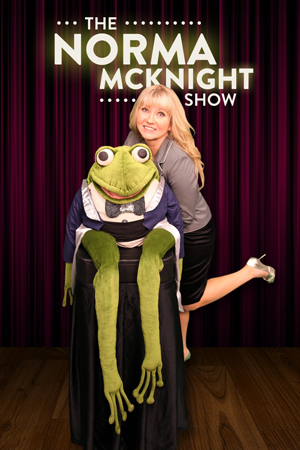 Norma McKnight is Canada's amazing comedy-ventriloquist. She recently wrapped up her position as principal puppeteer and contributing writer for the late Shari Lewis' "Lambchops Play Along" television show. Most recently she has appeared on the Comedy Network’s “Adventures in Comedy”. She perform’s regularly on board some of the worlds leading cruise ships and has performed at hundreds of corporate shows and public festivals. "Everyone raved about your performance and repeatedly commented on how talented and professional you were (I know my cheeks were sore from all the laughter!) I would gladly recommend you to anyone looking for top-notch entertainment"
"During your performance, I took a moment to glance at the audience. I noticed that EVERYONE was laughing. Not just a chuckle here or there but body shaking laughter. At that point, I knew hiring you was the best thing we did that night"
"Norma's performance exceeded all expectations. Her technique as a ventriIoquist and her comedic talent is truly remarkable and matched by her impressive abiIity to read the audience. Many of our group are still talking about the interlude when Norma replaced a dummy with one of our executives. Hilarious!" "Norma had the audience captivated with laughter and interest. The material selected for the evening was perfect and her knack of selecting individuals as the focal point of humor was superb. It would be fair to say that Norma was greatly responsible for what was truly a successful evening"
"I have received nothing but praise and positive comments attesting to not only your professionalism. but also your amazing technical skills as a ventriloquist, extremely funny material and an uncanny sense of comedy and comedic timing while Involving and encouraging audience participation"
Noteable Entertainment & Events is a Vancouver based booking agency, party rental, entertainment services and event production company. If you are interested in booking Norma McKnight please contact us.